Perfect location for arriving with the airport express and exploring the old Eastern side of Berlin. Located by Alexanderplatz subway station, Hackesher Market and the main square. An impeccably clean, modern and comfortable hotel. Especially quiet rooms offering a good nightÃ¢â¬â¢s sleep. Excellent value for the money located in the eastern part of the city, close to a key Berlin hub, and within walking distance or public transport of museums and attractions. 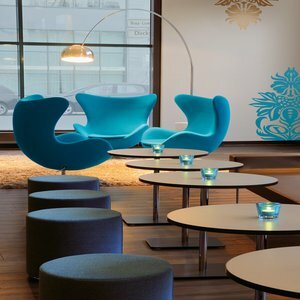 Rooms at the Motel One Berlin-Alexanderplat face the courtyard or street and parking is available underground. Abundant breakfast buffet available. Stylish rooms with wonderful decor and interiors. Guest rooms offer views of the city or courtyard. Each room includes a queen or double beds, a desk, wardrobe area and television. Wireless Internet access is available for free when purchasing breakfast. Compact rooms are well-insulated and soundproof. Thermostatically-controlled, clean rooms with two closet areas. This location is great for anyone wanting to explore the Mitte district or the political district of Berlin on foot. Twenty minutes from Kurfurstendamm by subway. Most of Berlin's major attractions are within walking distance, and public transport is nearby. Getting to Motel One Berlin-Alexanderplat from Berlin Tegel airport is very easy with a direct bus from the airport to Alexanderplatz, only two minutes from the motel. Plenty of restaurants and shopping around the hotel.